BVS Solitaire Collection Game Review - Download and Play Free Version! Explore the World of Solitaire with 385 Different Versions in BVS Solitaire Collection! Tip-of-the-Day displayed each time you open the game, and you can scroll through and see all the tips. Plenty of games (385) and a compilation of your statistics for each. Tells you a game's difficulty before you play it and whether it is more skill or luck based. Decent graphics with a choice of backgrounds and card backs. Amount of games can become overwhelming. No random game feature, so you have to choose exactly what you want to play from a large list. No animations, music or other features at all. With 385 versions of solitaire, this collection is a dream come true. Choose from solitaire games like Baker's Dozen, Courtyard, Simple Simon, and many more games ranging from easy to difficult. Play old favorites or learn a new version of solitaire every day with this collection. Each game has rules and a demo to teach you how to play quickly and easily. Change the background or card back designs to personalize your playing experience and create a relaxing atmosphere that's all your own. The save feature allows you to come back to any game. View your statistics to see how well you've done on your past games. There's always a new version of solitaire to learn in this game. 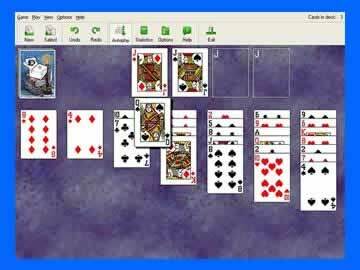 With this many interesting versions of solitaire in one easy place, boredom no longer has a place in your life. If you're a solitaire fanatic or just looking for some excitement, BVS Solitaire Collection won't let you down. Start dealing those cards! BVS Solitaire is a fairly well put together collection of solitaire games for the solitaire enthusiast. 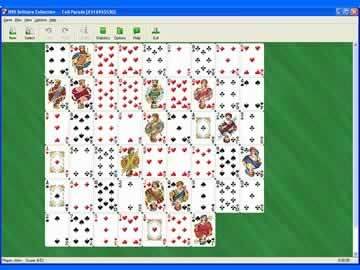 It boasts 385 different solitaire versions and decent graphics, and allows the player to choose from several brightly-colored backgrounds and a wide variety of card backs. With a game for every day of a year and then some, BVS Solitaire will provide hours of card-clicking fun. BVS Solitaire offers an incredible 385 different versions of solitaire for the both solitaire enthusiast and the beginning player, including Klondike (the version that comes with every Windows operating system), Golf, TriPeaks, Free Cell, Pyramid, Yukon, Parade and Baker's Dozen. Each has different rules and strategies, but for the most part the goal is the same. Generally, you must clear all the cards in the tableau (piles of cards you need to get rid of) by stacking them in some way. For Klondike, the method is to stack the cards chronologically from Ace up to King, alternating color as you go. For TriPeaks, you must clear all the cards by clicking on cards that either directly above or below the starter card in value, regardless of suit or color. This means that if the starter card is a Jack, you can either clear a 10 or a Queen, and so on. 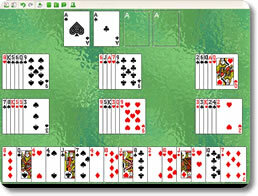 Most players will not have encountered many solitaire games beyond the typical Klondike version. BVS Solitaire provides a great Help feature that instructs you in fairly easy to understand language how to play each game. It explains your goal, the rules, and how to win, and includes definitions for those hard to understand words like tableau and foundation. The Help window is accessible at any time from the game screen should you forget some of the rules or require further help. This is a great feature and very helpful, especially for newer players, especially because it tells you how hard the game is, meaning either Easy, Medium or Difficult and whether winning that particular game is more skill of luck based. Some of the hardest games, like Golf, are based entirely on skill and are very difficult, while Klondike is a 50-50 mixture of skill and luck and is relatively easy by comparison. Unfortunately, the audience of BVS Solitaire is still pretty limited because of the nature of the game. It isn't something younger players would be able to grasp easily or even be entertained by, because there is little that is very visually or aurally stimulating, and most of the games require a deep understanding of the rules. The graphics are fairly well done, and are relatively sharp and clear, with large icons for the important buttons (like Undo Move, Statistics, Auto-Complete and Help). While they are better than most solitaire collections, the graphics will not blow you away by any means. There are some colorful backgrounds and you are able to change the card backs, but there are no animations other than the cards moving around the screen. There are also only accompanying sound effects, but no music, making the game feel sort of disconnected. The sounds effects don't add anything to the game but don't detract much from gameplay either. The gameplay is somewhat addicting for the solitaire enthusiast, but casual players will likely find it repetitive and potentially boring. The different games all end up feeling pretty similar, since they are all played a similar way with pretty similar rules, and without a storyline or other overarching feature, there is no end goal other than getting high scores on your games of choice. This limits the audience and means that most player will not want to play for very long at a time. There is also no random game feature, so player will have to become familiar with the huge selection in order to really progress through it. On the other hand, BVS Solitaire has a Tip-of-the-Day feature that pops up every time you open the game, with the ability to scroll through and see all the tips if you choose. In general, BVS Solitaire is a fairly good collection of solitaire games that are fun to play. While the audience is limited by the rules of gameplay, the overwhelming amount of games to choose from with no random game feature, the lack of audio-visual stimulation, and repetitive nature of the game of solitaire, the collection itself is fairly well done and will provide hours of fun to the solitaire fanatic. While not the best card game out there, BVS Solitaire is one of the better solitaire collections to play. If you love solitaire, or want to find a few solitaire games you can become really good at, give it a try and you are sure to find at least one solitaire version you enjoy.